T-220 - This stands for thread count. The thread count is the number of horizontal and vertical threads in one square inch of fabric. The higher the thread count the softer the pillowcase will feel. Please note this is an all cotton pillowcase and it will feel very soft. Some people do buy these to screen print, HOWEVER, they are manufactured with institutional use in mind. Keeping this in mind a small percentage of the pillowcases might not meet "some" of the screen printers quality if perfection in each pillowcase is examined. If you buy for screen printing always assume 1% to 2% might not meet your needs and buy extra for your project. 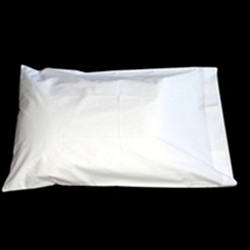 We do not provide credit for pillowcases used for screen printing if minor errors in quality are present. Now Available! Order online or call if you want to place an order over the phone.